The Formula 3/5 – Why is it so Important? Selling skill is like a tree: it grows by itself when you practice it more and more, roots itself deeply into you when you learn and master it and flourish over as you gain experience. I strongly believe that selling in retail stores is no more an easy task, especially in today’s situation when customers are more informed and often pre-sold even before they enter the store. Achieving targets and winning customer loyalty have become a real challenge. And the biggest barrier that I have understood from my experience in the trade is the ‘Attitude of the people engaged in sales’. Guiding clients into buying by manipulating their words and weaving them with typical sales jargon when they enter the store, may not work so well. Gone are the days of hard sales. Today your customer wants to have a pleasant buying experience. Instead of just being sold, the modern day customer is keen to enjoy a buying experience. Basically, they want to spend time while buying. The challenge lies in giving them what they want and understanding their needs. All human beings essentially have certain mental triggers that drive their actions. In order to influence and understand your customers, you need to know what those triggers are and how to utilise them in your selling script. Be There: Be ready to serve the customer right when he needs. Be Useful: Provide useful information, talk what is relevant. Be Quick: Remember that you need to compete with the speed of internet in their hand. Your own skills and ability to perform. Great sales people are passionate about their profession. Passion is a way of believing. It is woven into your cellular structure just as much as your DNA. Your passion should teach you to perform and achieve your goals. So if you choose sales as your career, you must embrace it and enjoy performing on the floor. The reasons are simple. In sales there are only two things – either you win or you lose. There is nothing in between. Moving on to the connection to optical trade. Like many other products, sunglasses are also a unique category. They are accessories high on fashion and utility for the person who wears it. A potential customer coming primarily for the spectacle and you advise him to buy sunglass as an additional pair. The other situation is your potential prospect’s entry is primarily for the sunglass only. In the situation where the customer comes primarily to buy sunglasses, you need to adopt the well defined process of sales, starting from creating the first impression and understanding the need to building up trust and then closing with the sale of sunglasses. Whatever may be the situation, you need to know the basic guidelines that you can follow while dealing with your sunglass client. And The Formula 3 / 5 sets up a guideline to select and sell the appropriate sunglasses to your customer. It has been designed based on the Science of Optometry. It gives us 3 objectives or purposes, why a person would like to buy sunglasses and also provides 5 strong attributes that can encourage your client to buy a pair of sunglasses. Prevention, Protection and Enhancement are the three main driving factors that attract someone to buy sunglass. The preventive side of optometry is often not very clear. There have been a lot of articles and studies that say that non-ionising radiations contribute to an ageing effect in the eye, especially cataracts and macular degeneration and the signs of overexposure to sunlight which includes pinguecula and pterygium. These risks can be averted by wearing sunglasses. The philosophy of eye protection depends primarily on avoidance. Of all the serious eye injuries recorded, none of the patients had worn any eye protectors. In sports, the risk of traumatic eye injuries is almost inevitable that may include injuries like blow out fractures of the orbit, tears in iris, retinal detachment and penetrating eye injuries. A well designed sunglass gives protection against light from the sides and above, impacts of particles and insects, and shields the eyes from pollen and wind. With the right choice of lens, complete UV protection can be ensured. A good quality sunglass protects the eyes from the sun’s brightness and glare that may cause squinting, eyes to water and possible headaches. It does not interfere with comfortable vision and ability to see clearly. New researches are aiming to justify the need of sunglasses to prevent the effect of jet lag, improve reading performances, and reduce the effect of migraines. Lightweight organic lens material offer superior comfort as against mineral glass lenses. Sunglasses are also used as safety lenses. Together with fire resistance gloves and other safety gadgets, polycarbonate sunglasses are important ocular defence gadgets. Polycarbonate and Trivex lenses are especially suited for sunglasses. The toughness of polycarbonate lenses is tested against highest velocity and high mass impact with greatest hit. Don’t let chunky robust frames be an appliance to injure your clients, instead choose one that safeguards them from trauma. And you as a dispensing optician should know the right materials that will prevent trauma. The lenses should be optically correct and distortion-free. Instead of dimming the colour, it should enhance the colour and contrast. Wrapped lens configurations optimise peripheral vision and protection, but such extreme contours also cause optical distortion due to the bending of light. Technology designed to manufacture sports lenses prevents this distortion and maintains clarity at all angles of view, even along the lens periphery. This has been possible because of 3-dimensional optical correction, not just 2-dimensional used for conventional lenses. Make sure the sunglasses fit the face of your customer properly. Insist on the eyewear being tried, and that they don’t pinch around the head. The weight should be evenly distributed between the ears and nose, and the customer’s eyelashes shouldn’t touch the frame or lenses. Only a good dispensing optician can do this, not the sunglass vendor or a salesperson in a departmental store. This is where you as the optician have an advantage. Sunglasses are one of the most important fashion accessories. They add that extra zing to the wearer’s appearance. Always recommend a branded sunglass. The brand has a legacy and reputation and when you give the same to your customer, you actually offer them top value protection for their eyes. A good quality sunglass in real sense is made with highly sophisticated technology, with a lot of research behind it and has to pass through numerous stringent quality control processes. Each sunglass is tested for their impact resistance ability, light absorption and transmission, glare control, reflection prevention, surface regularity and non-ionising radiation protection, before it reaches the eyes. 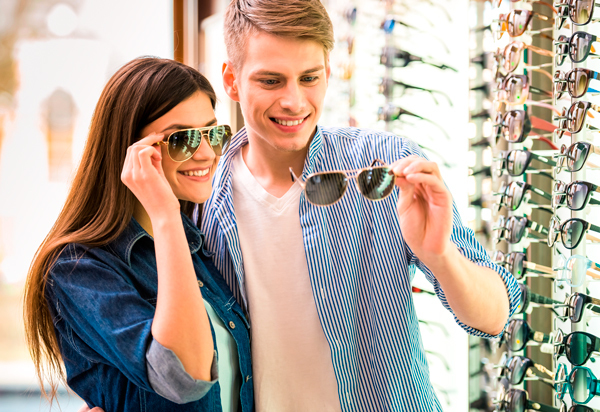 With this detailed understanding in your mind, it becomes easier for you to plan the perfect sales pitch to get your customer to buy a pair of sunglasses. I am thankful to Dr Sambuddha Kundu, Medical Vitreo Retinal Fellow and Phaco Surgeon, who spent his invaluable time to review this article. I am thankful to Mr Mitul Das, for his invaluable contribution to this article. The article is contributed by Ajay Kr Bhootra, author of various books like Optician’s Guide, Low Vision Aids Practice, Elite Sports & Vision, and many more. He is going to come out with his first fiction book, Yet We Marry.